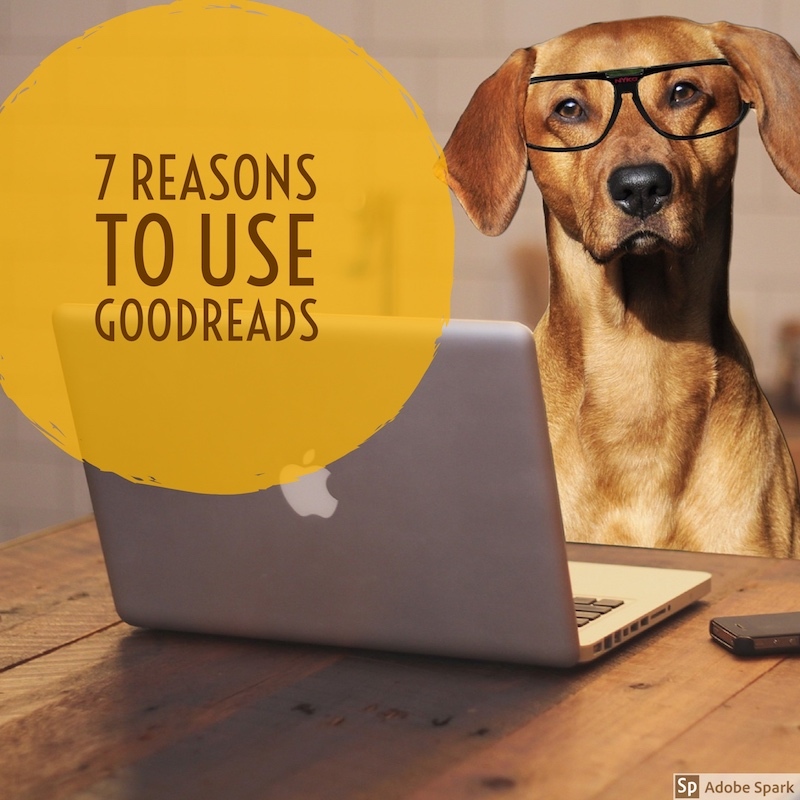 If you’re a book lover, chances are you have a profile on Goodreads. But I’ve discovered that even some seasoned users may not be familiar with all the features this wonderful site has to offer. Technically, Goodreads is what is known as a “social cataloging website.” I explain it as Facebook except it’s all about books! Founded in 2006 (launched in 2007), Goodreads’ mission is “to help people find and share books they love,” and they’re doing a pretty impressive job! 2017 stats show 65 million registered users and a catalog of two billion books, with 68 million posted reviews. Think of it like a ginormous book club! So obviously you can read books reviews on the site, but did you know there is so much more available to us serious book nerds??!! You can track what you’ve read and whether or not you liked it, and mark books as To Read. With this information, Goodreads will make suggestions of other books and authors you may like. The more you rate, the better these recommendations become. I’ve discovered some cool stuff this way. Each January, Goodreads offers users to join their reading challenge. The only thing you have to do is choose a number of books you want to read this year and then do it! 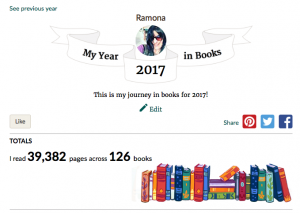 All year long, Goodreads is compiling your data and at the end of the year, you get a link to a beautiful page that summarizes your year of reading. There’s much more to it than this! Looking for books with a cat on the cover? In the mood for a romance set on the beach? Curious about which books were popular the year you were born? There’s a list for that! Search Listopia for just about any specific category and you’ll discover someone has already done the work of collecting titles to meet your criteria. It’s a super helpful tool for reading challenges! This is one of my favorite features. Members can enter to win books, no strings attached! I have read somewhere that people who write reviews are more likely to win, but I don’t know how valid that is. I can tell you I’ve won twice in the almost 5 years I’ve been using Goodreads, and I don’t enter a ton of Giveaways. The coolest part is publishers and authors often give away pre-release books, so it’s a way to read new stuff before the masses! Your Goodreads profile can connect to your Facebook profile so you can be connected to your friends in this bookish world. I have it set so my book reviews post to my Facebook, which has started countless interesting conversations with friends on there that I wouldn’t have had otherwise. 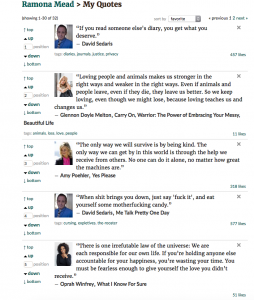 There’s a feed similar to the FB timeline, which shows you which books friends are reading and rating, if someone entered a giveaway, or commented in a group. 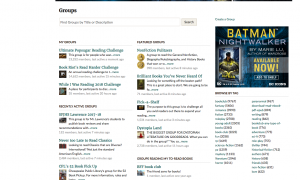 And speaking of groups, they are an awesome way to interact with other readers, even if you aren’t “friends.” Each of the reading challenges I participate in have a group, for participants to brainstorm and discuss categories. The Goodreads community also provides a monthly newsletter, and quizzes, which are a fun way to test your bookish trivia. Technology and social media have blurred the lines between celebrities and fans. Goodreads uses this in a beneficial way, facilitating author-reader interactions through interviews, particularly their Ask The Author section. 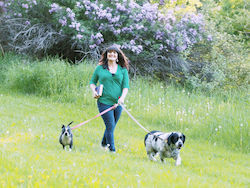 All authors have their own profile and blog, but some are more active than others. I see lots of positive, kind, grateful interactions between readers and writers! While many booed the acquisition of Goodreads by Amazon in 2013, it opened up many channels of access. Users can read or listen to a preview of book using Kindle Cloud Reader and Audible. 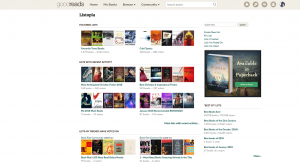 There are even more features to Goodreads than this list, so you’ll have to explore and find them! These are the ones I find most useful and have made Goodreads a part of my daily reading life. I didn’t actually know about some of these features. Thanks for letting me know!